SPACE, LIGHT, VIEWS AND VALUE! 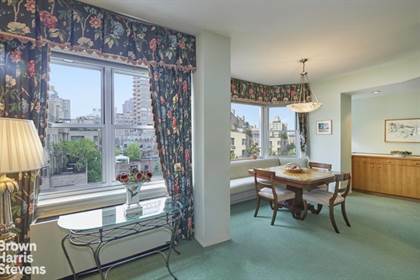 On a high floor, facing 83rd Street with lovely skyline exposures, this gloriously bright 2-bedroom, 2-bath home has an expansive living room with 9 foot ceiling, enlarged open dining area, updated kitchen and baths, washer/dryer and amazing closet space. Large bay windows in the bedrooms and dining area provide views to the East and West and an oblique view of the Metropolitan Museum. 8 East 83rd Street is a prime full-service cooperative superbly located on a lovely tree-lined street, one half block from the Met and Central Park. There is an attended garage with direct building access and laundry room with new equipment. Two staff members attend the lobby. Pets, washer/dryers and pieds-a-terre are permitted, subject to Board approval. Monthly capital assessment of $340.30 through December 2019. The Local Law 11 repairs and lobby renovation are almost complete. There are plans to reface the first two floors of the building's facade in limestone. Hi, I'd like to find out more information about 8 East 83rd Street. Thanks so much!